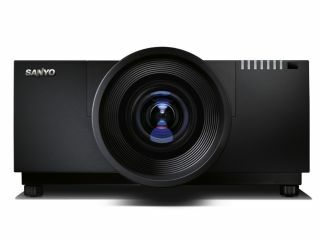 The Sanyo PLV-HF10000L projector has been announced, with a native 2K resolution of 2048x1080. Sanyo, now owned by Panasonic, is pitching its latest projector at professionals or prosumers, and it is designed for large rooms. The Sanyo PLV-HF10000L projector offers 3000:1 contrast and the QuaDrive Optical engine for accurate colour reproduction. "Integrated QuaDrive technology provides outstanding colour reproduction. This unique technology uses a fourth panel – the Colour Control Device (CCD) – to separately control yellow light within the optical engine," explains Sanyo's release. "The result is increased colour purity, more realistic colour reproduction and an increase in image brightness." Several projectors can also be teamed up to create one large image with an edge blending function. It has a UK release date of November 2010, and although the price has yet to be announced we reckon it will be fairly hefty.